Firearms must be an integral part of any survival and preparedness system. Why? The reason is simple. The power grid is down. Communication methods do not work. All businesses are closed. No method for pumping gas. Groceries cannot be purchased. Medical prescriptions will not be filled. Most automobiles won’t start. No TV. No drive thru’s. No calling your loved ones on your cell phone. No going to work. No running up to the corner store for a gallon of milk and loaf of bread. Life as you know it has ended. How are people going to deal with this situation? Within hours panic will set in as no one will know what happened. People will be displaced from their homes with few methods of traveling other than to walk. Within days food, water, and medical supplies will start to run out and desperation will set in. It is a cold hard fact that people who are not prepared will either die or more likely they will look to take from others. Guess who “others” is. It is you and you must be prepared to protect your supplies and your family. Survival situations vary widely as to conditions, threat level, environmental specifics and longevity. During Hurricane Katrina in 2005 gangs of looters violently rampaged throughout New Orleans– even in broad daylight. Armed robberies and even sniper fire went on for days and gunfire could be heard throughout the city. The point is that in any serious situation – predators will take advantage and violence will spread. Due to the unfortunate fact that no one knows what the future holds or what type of situation one may find themselves in – I approach the structure of a survival battery with diversity and flexibility in mind. It is a requirement for a battery of firearms to be able to function successfully in as many situations as possible. For the rest of this article – this is a given. My preparedness philosophy regarding firearms and selection may not work for everyone. Firearms are a very personal thing to most people. What follows is a general recommended structure for building a survival battery. Semi-Automatic Rifle/Carbine – Used for ranges short (0 yards) to medium (150 yards+) depending upon specific model and caliber. Quick Handling – A long gun is not nearly as maneuverable as a short gun. For moving though tight spaces, room to room, and getting in and out of a vehicle – shorter firearms make such tasks easier. Lightweight – The lighter the weight the less effort needed to carry it around. Having owned the Stag Arms Model 2L pictured above for 3 years I have found it to be extremely reliable and accurate. My preferred firearm for this category would be any quality AR-15/M4-type weapon. I prefer the AR-platform of weapons as it has a proven track record of reliability and performance. Another advantage to the AR is the availability of many accessories available so each firearm can be tuned to fit its owner. Quality high capacity magazines are very plentiful and as of this writing are very inexpensive (due to varying political climates this could change at any time). Largest drawback for the AR-type firearm is the lower powered cartridge,which limits its range, and the cost of the firearm itself. AR variants are not inexpensive. 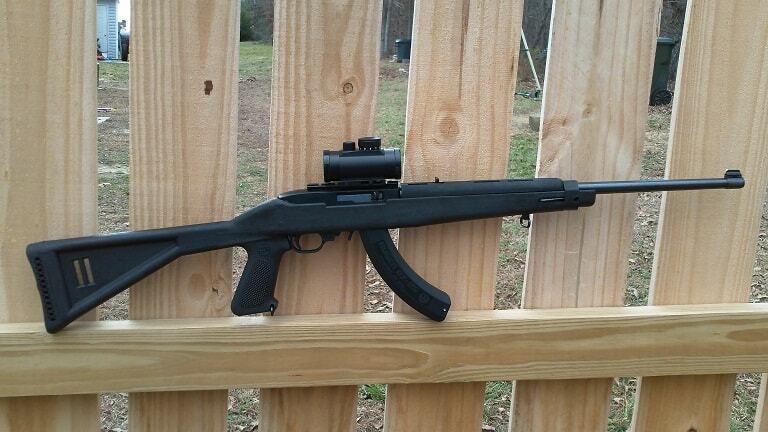 A very popular and capable semi-automatic firearm is the Ruger Mini-14. Costing a few hundred dollars less than most any AR-variant the Mini-14 is reliable (with proper magazine selection) and with some recent manufacturing improvements very accurate. 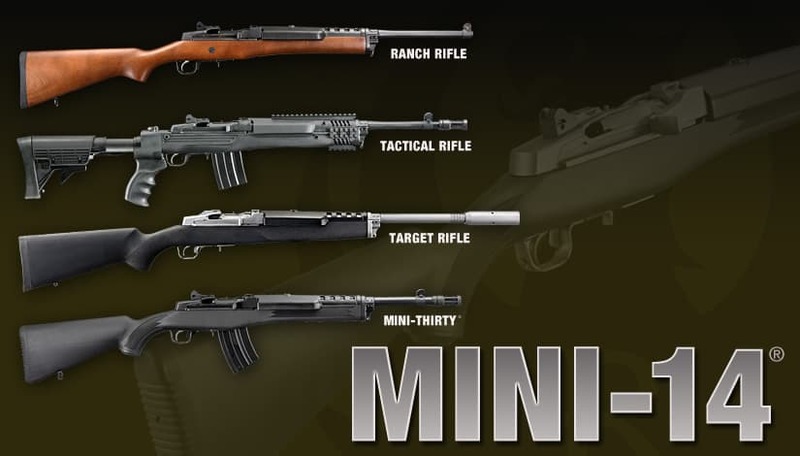 The Mini-14 fires the .223 Remington cartridge which is nearly identical to the AR’s 5.56mm round. The AK-47 is very popular and has an exceptional track record of reliability in most any condition found on the planet. Firing the 7.62x 39mm cartridge – the AK edges out the AR platform in the power category. The AK-47 is worthy of consideration when looking to purchase a semi-automatic rifle/carbine. Pistol – Used for short range situations such as house clearing and when a long gun is not available. Generally carried on the hip ready to be accessed when needed. Allows hands to be free and still be armed. Quick Handling – For moving though tight spaces, room to room, and getting in and out of a vehicle – pistols are excellent. Lightweight – The lighter the weight the less effort will need to be made to carry it around – and the quicker the pistol can be moved into position. 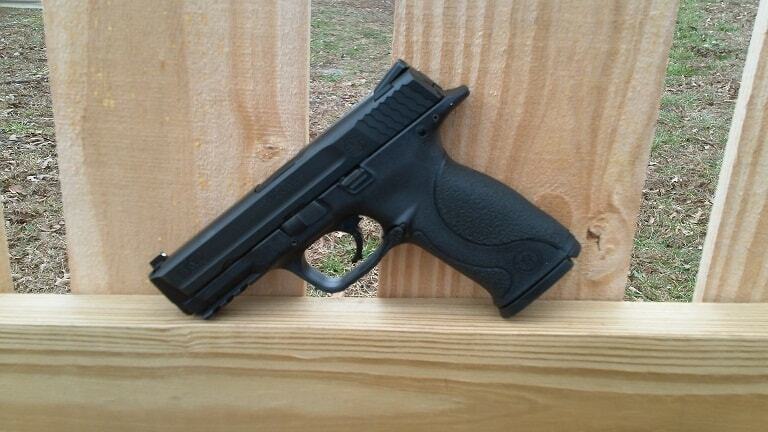 The Smith & Wesson M&P9 9mm is a fantastic pistol. Extremely reliable and superbly accurate – the M&P is an excellent choice for a sidearm. The ergonomics are fantastic and recoil is negligible. Trigger pull is better than acceptable and quick follow up shots are easy. 17 rounds of 9mm are held in each magazine. Cost is in right in line with other polymer framed combat pistols. Alternatives: Pistols are very much like cars – everyone has their personal preference and this is one of the reasons there are so many to choose from. There are many reliable quality pistols on the market today. Most any of them would do just fine as a defensive pistol. Shotgun – Meant for short ranges from point blank to 25-30 yards. Shotguns can fire shells of different load types for different purposes. Due to the ability to fill many roles – the shotgun is often looked at as the most important and versatile piece in a survival battery. Full Cylinder Bore – This means no choke on the end of the barrel. Quick Handling – 18” – 20” barrel maximum length and full stock only – no pistol grip stocks. The Mossberg 500 carries an excellent reputation for performance and value. Available in many different models – the Mossberg 500 can be purchased with a multitude of options and due to high aftermarket support can be outfitted to fit each owners needs. Bolt Action/Long Range Rifle – For engaging targets out to 300 yards and beyond. Excellent for hunting large game. There are so many great bolt action rifles like the Winchester Model 70 pictured above – can’t pick just one. Ruger, Marlin, Savage, Mossberg, and Remington all make rifles of varying prices and each carrying unique features of their own. Prices for these quality firearms can vary from just a few hundred dollars up to a few thousand. Budget-minded folks can buy a bolt action .308 with a scope for under $400 and be able to hit a gallon milk jug at 200-300 yards. Utility Firearm – Versatile firearm to be used for training, harvesting small game, potential – but not recommended – for self defense. Lightweight – The lighter the weight the less effort will need to be made to carry it around. The Ruger 10/22 is arguably the most popular rimfire rifle ever sold. With its rotary 10-round magazine this carbine can fire literally thousands of rounds without experiencing failures of any kind (proper cleaning needed of course). A proven firearm – the 10/22 has good accuracy and due to tremendous aftermarket support can be accessorized per the owners requirements. Alternatives: Although there are several very good rimfire carbines and rifles on the market made by major gun manufacturers – the Ruger 10/22 in my opinion is inexpensive, ultra-reliable, accurate and fills the role of “Utility Firearm” like no other. You can’t go wrong with the Ruger. These have been my recommendations for a basic survival battery. As already stated – not everyone will agree with it nor will it work for everyone. Folks living in the city will certainly require a different composition to their battery than those living in rural or country areas. This should serve as a basic guideline to assist in developing your own survival battery. Safety, safety, safety – Common sense I know but when dealing with firearms that have no compassion for you or your family – the person behind the trigger must. If unfamiliar with firearms – take a course and learn to handle your firearms appropriately and responsibly. Ammunition – A rifle without ammunition is a very expensive and poorly made “club”. Find what ammunition your firearm likes (reliability and accuracy) and stock up on at least a few thousand rounds of each caliber for each firearm. Magazines – Several spare magazines should be purchased for every single magazine-fed firearm in your survival battery. Factory magazines are often the most reliable however some aftermarket models work extremely well. Research your particular weapon to determine what to buy. Regardless – stock up as many as you can afford as what you have may be all you can get should a serious situation develop. 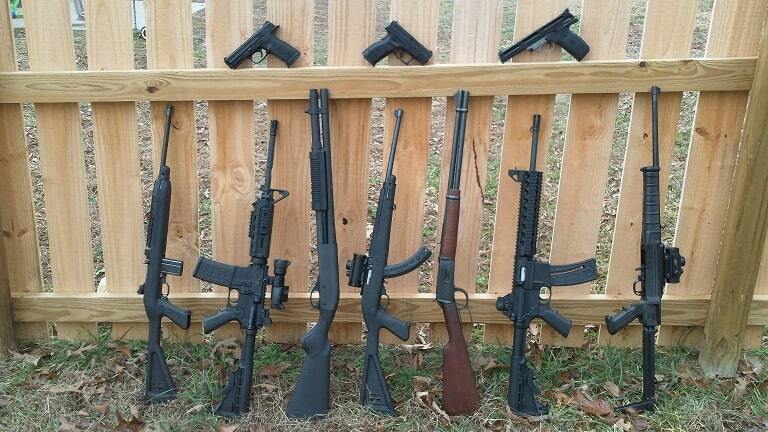 Take care of your firearms – After each use each firearm needs to be cleaned and lubricated. The better you take care of them – the more likely they will work to take care of you. Cleaning kits can be found at any local gun shop or purchased online very inexpensively. Optics – Make sure you can shoot each firearm accurately prior to placing any optic on it. Optics such as red dot sights and scopes are great – but they can fail. Should your optics fail – be ready to use standard open sights. Equipping members of your group – Assuming a survival battery of firearms are meant for more than just one person – how should each person be armed? One pistol and one long gun is my suggestion. Remember……gun control is being able to hit your target! Response to recent comment: Are you truly prepared use deadly force after SHTF? Just FYI if you look at the Mini 14 it has 223/ 5.56 stamped on the barrel. I did not know that. I owned a Mini-14 years ago and loved it. Back then I bought polymer Ram-line magazines and they worked flawlessly. I am wondering why one your requirements for a shotgun is a fixed stock without a pistol grip. Not saying I have a problem with that, I am just wondering the reason. Is it personal preference, or is there some kind of study out there that directly links fixed stocks to more accuracy, better functionality etc, etc. I have debated this myself. I like fixed stocks dont get me wrong, but I see a lot of people saying that a PG configuration of any sort is worthless. 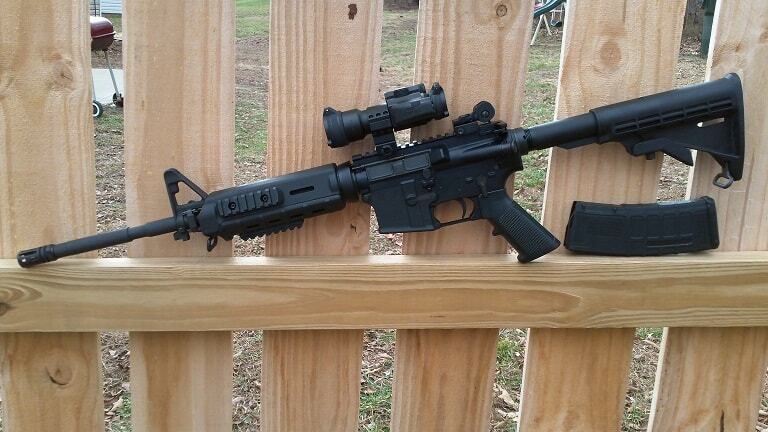 It seems that accuracy is not diminished, and the ergonamics are no different that your standard semi auto AR-15. It also adds a few things to the table like the ability to store, and carry a more compact platform. Now, I am not a fan of PG only configurations, but having a folding stock seems to fit the bill. I would like you to expand on that consideration if you would. Other than that, your list seems pretty standard fair. I own over half the primary guns on your list (with plans to buy the other ASAP). I have used both pistol grip full length stocked tactical shotguns as well as standard stocks – I just find the standard stock faster. I like both – and to each his own. I just may put a Choate stock on my 870 – who knows. I do not think there is any effect on accuracy. Just to clarify my previous comment regarding accuracy. The accuracy comparison includes a folding stock, not PG only. Why a bolt action long range rifle? If you are running an AR carbine, why not go with a 20″ barreled 1 in 7″ twist AR with a scope shooting 77 grain SMK rounds for your long range needs. Same mags, parts and ammo. Keep your logistics simple, no need to have 4 different calibers, when 3 will do. Your suggestion is absolutely doable. Disagree with a few small points(prefer 40 S&W over 9mm, AK over AR), but a informative beginning point the non gun knowledgeable or newbie prepper. Important thing to remember is to consolidate your ammo as much as possible. Hi-Point pistols and carbines are a good example. Doing good work J, keep it up. No problem on the disagreement. As I stated early on – my recommendations are not for everyone. I guess that is why they make so many different guns – there isn’t one to fit everyone. These will take you from point bank to as far as your scope can get you. Your logistics will be at a minimum and you have a domestic ammo supply. I think I enjoyed this article more than any piece since finding ModernSurvivalOnline a few months back. I believe this author and I are of the same mindset in that I own several of these weapons systems. Perhaps we served in similar positions in the military. Anyway, I advise friends that have not started “prepping” to begin their arsenal with a 12 gauge pump shotgun (same 2 models as in the article), a Ruger 10/22 rifle (Takedown) for ease of storage & concealability & handgun (I push for versatility: Governor .45LC/.410GA/.45ACP or .357MAG/.38SPC). Although I do not own a large caliber, bolt action rifle, I recommend .308 or 30-06. Should my family be forced to hunt for food, we’ll be using .223 and 12 or 20 gauge with slugs. I never served – something I truly regret. Out of all those firearms listed – I do not own a bolt action either. My brother on our bug out land has a nice .300 Savage and I do own the Winchester 94. I’m glad you went with a 10/22 and not a AR15 in .22. Those are +$500, a 10/22 can be had for less than $200 at a box store. The remaining $300 is a lot of accessories & ammo. I still would argue that a bolt action .22 is a good alternative to the 10/22. The Savage base model can be had for the same price. There won’t be as many accessories, but you won’t be able to waste as much ammo. But it would be even more difficult to press into an emergency defensive role. It depends on what you think your needs are. While I appreciate this knowledge, it makes me cringe. I get that in a life or death situation, you need to be prepared. I know that if someone was going to overtake my home and/or cause harm to us, I would shoot to mean it- no second guessing. BUT, I can say that now, not in that situation. What my fear is, that I may hesitate that split second to let my brain tell me that they don’t just want something to eat or some material thing- they mean harm at no cost. It isn’t war here in this country. See? When Katrina hit, it was a tragedy, no doubt, but as bad as it got, I don’t remember hearing one person shot another over food or looting. In this country, while I absolutely believe we need to be prepared, our tragedies, in this current time have been for a finite period of time- even if we lived in horrible conditions for a year or more, would I be ready to kill? When all is said and done, will my children be orphans because their mother shot someone? Thoughts? Sorry, I was so excited about the topic of the article, I did not notice that you were the author. Our battery started very simple: M4/M1911A1 for me, Son#1 was assigned a Mossberg 12 GA pump & S&W 19, wife had the Savage 24J 22LR/20GA plus a Walther PK380 and my youngest had an AR7 and Sentinel 22s. I did expand as funding permitted: Mini-14, Mossberg 930 SPX, Remington 870 (20GA) and a Ruger 10/22. I purchased some new pistols as well: Governor .45LC/.410GA, Ruger Security-6, Walther PPK/S and S&W Bodyguard .380. We definitely think alike in that I love Ruger firearms, too. Again, excellent article! You are serving now, in the new militia! Patriots (Preppers) will be charged will rebuilding America after collapse. I noticed your AR was a “lefty” model. I am a left-handed shooter too, but my AR is the more common right-handed version. The reason is simple….Parts. Battlefield “procurement” of spare AR parts will most likely be off of the more common right-handed AR’s. My suggestion to left-handed AR owners would be to become proficient with the “righty” version before SHTF. You are correct. I have always shot right handed designed guns with no issues. Saw the lefty Stag and went for it. My next AR will be a typical righty. I just picked up one of those Ruger 10/22 Take down models and so far im very impressed. I have seen no negative effects regarding the accuracy and the general functionality bc of the two part design. I think it was an excellent addition to my own battery. And just an added note if your state allows it I would recommend the BX25 Ruger 25 round mags I think they are the best high capacity 10/22 mag on the market. I love the BX25 magazines. Work great! Great post Rourke. Here is my 2 cents on the topic and some comments…. Agree with the recommendations for the most part. I like the 4 gun combo of a pump 12 gauge, 22 rifle, adequate caliber hand gun, and some type of centerfire carbine/MBR. For pistols I would suggest a minimum of 9mm or 38 in a wheel gun. A revolver is not ideal but if it is what you have and concealable the work on other priorities first. Also, it needs said that you need some type of holster to CCW the hand gun. 22 caliber rifles should be the first or second long gun a person aquires, closely tied with a 12 gauge pump. I love my 10/22s as they are pretty accurate and with the 25 round mags can serve in a pinch for light defense. Get a scope. I like a 3×9 as opposed to a 4x 22 scope. Also get a sling and some extra mags. Like someone mentioned. A bolt 22 is still good for all 22 needs except defense but if you have a 22 move on to priorities. I like my pump shotguns. 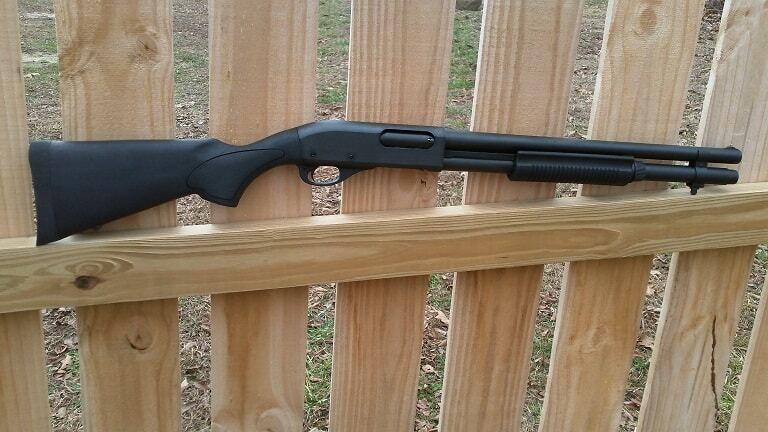 I have an 870 and a Mossy 5000 persuader. I have short tactical barrels, mag extensions, but I still need slings. Get side saddle shell holders or stock shell holders so you always have 5 more rounds with you. I have both AK-47s and have one Rock River AR. Love them both. If I hade to take one to the woods it would be a tough choice. I lean towards the AKs as I also have 2 Russian SKSs which use the same ammo so I stock the 7.62×39 in greater quanities. I have alot of woods in my location so I also subscribe to the slower heavier round going through the bushes like the old 30-30. Some type of heavy hitter is a plus. I have a beautifle spanish mauser in 308 on loan from a fellow prepper…he has several. I also have a 6mm , 30-30s and several other less ideal options. 4. Semi auto tactical rifle. 5. Maybe a heavy hitter. If number 4 is 308 than you killed 2 birds. Put a sling on all long guns. You can’t do much else if you are toting a rifle. And of course extra mags and ammo. Love your choices and recommendations. If you want to get all of the opinions on the table, just start discussing the “best” combination of firearms for survival, hunting, and defense. What works for you – budget, availability, comfort, portability, reliability, familiarity, etc? Everybody has a budget, otherwise I would own a .408 Chey Tac. Not everyone is as lucky as I to live in Texas where we don’t place unconstitutional restrictions on firearm possession. I shoot a .338 Lapua for long range, it kicks – a lot. If weight and size wasn’t a consideration I would use a Browning M-2 as my personal firearm. If it doesn’t work everytime you pull the trigger it is only good as a poorly balanced club. The US Army made me use a M-16 and I am intimately familiar with the entire family – still don’t like the light weight .556/2.23 cartridge. Get a range of weapons (no pun intended) which you can afford to shoot regularly. Go to the range (or pasture) regularly. Develop a close and personal relationship with your firearms. Practice, practise, practise, and then practise some more. Make the weapon an extension of your every existence. When the dung hits the rotating air mover, you will have lots of other things to consider – where the effin safety is located and how to rapidly change mags should not be one of them. Accurate shot placement with a .22 lever action is much more effective than spraying 5.56 from a belt fed M-249. Nothing is more discouraging to an assailant than a 40 grain piece of lead entering their eye socket at 1,000 FPS. FYI – my line up is a Kimber Custom TLE II (.45), Springfield M1A with NM Barrel, Beretta TX4 Storm (12 ga), and a RND 2000 (.338) with a 26″ barrel. Though, I would really have a hard time leaving my Wetherby Mark V (.460 WM) behind if I was bugging out. It doesn’t reach out very far (300-400 yards max), but it will flip a car over when it gets there. Great advice! Love the Kimber line of pistols. Had the polymer framed 10-rd .45 several years ago – wish I never got rid of it. Would love to get a Springfield M1A – awesome rifle. Rourke- You mentioned that one of the drawbacks of the .223/5.56 was its range. I know a lot of SWAT teams use this round both on the AR15 platform and the Rem700 platform for long range (sniper) type work. I don’t fancy myself and expert shooter but I can take out a siluet at 300m without an optic. The US Army TM 9-1005-319-10 states that the M4 with the 16″ barrel or in the civilians case an AR15 with a 16″ barrel has a max effective range of 500m on a point target. If you have an AR15 with the 20″ barrel the max range on a point target is 550m. Now those figures maybe different depending on your ammo and barrel twist. Those were for a 1/7 twist firing 62-63gr rounds around 3100 ft/s. I can’t imagine a reasonable scenario that I would have to engage a target further then that. If I had to, my Rem700 in .308 would do it without any problems, and for the record that’s my recommendation for a bolt action hunting rifle. Very common round very reliable rifle and it won’t break the bank. I know some ex-military folks that talk about 500 yards with open sights with an M16 when they served. No doubt it is possible – but I will tell you I can’t do it. Now a .223 in a Remington 700 SPS – with practice. I would rather have a .308 for those ranges. I need to shoot more! Personally, I’d go with .40 S&W or .45ACP vs. 9mm as a ‘primary’ sidearm, but get a couple 9mm guns because it is a very popular caliber – that’s just me. I’d also get 2-3 10/22’s, not just 1 – your grandkids will be popping squirrels long after you are a memory. I’d also consider a Ruger Mark2 or a Walther P-22 – lightweight “hiker’ .22 pistols for when you aren’t carrying the Barrett BMG 🙂 . I have 3 Ruger 10/22’s myself along with a Smith & Wesson 22A rimfire pistol. Love the .22LR. I love the 45ACP as well. You need to change your mindset. In a situation where there is limited or no rule of law, there are people who would not hesitate a nanosecond to take your life if it would mean another meal for them. I suggest you, and this goes for all other posters who plan on using a weapon in defense of their life, take professional training in order to become as efficient as possible. Instead of buying 10 different weapons, keep your choices to a minimum and use the money for trigger time and classes. Make sure you are well stocked in all other areas as well. Can’t eat a rifle. When it comes down to it… if you’re being shot at, do you really care what caliber the round is? Will you be sitting there thinking.. Oh wait, that’s just a .22… no biggie. Of course not. In my opinion the .40 cal pistal is truly the best of both worlds. It has better knock down power than 9mm and has better penetration than the .45. Several people mentioned the 1/7 twist and to be honest, that isnt the most versitile choise. M4 variants are available with a twist rate of 1/7, 1/8 and 1/9. Of the 3 the the 1/8 is the best choise to get. The 1/8 will allow you to shoot basically any grain of .223/5.56. The 1/7 and the 1/9 wont. Also, 7.62×39 ammo is less expensive then the .223/5.56… and not sure why someone would choose a mini 14 over an AK/SKS, but ok.
Another point, the Springfield m1a wasnt event mentioned in the article. The M1A is arguably the best battle rifle ever made, also you can get 20 and 25 round mags for it. To each his own, but if people are trying to kill your family or steal your supplies that your lives depend on I’m guessing you will likely make a choice to either defend it or become one of the humans that don’t make it. To correct one of your points, during Katrina some police were given shoot-to-kill order for all looters – the police killed 11 people in the following days. I remember the Governor openly stating that the National Guard was highly trained and prepared to take out looters with their guns, or something to that effect. Some people were getting food for survival, and others were taking TVs and Jeans – I probably would’ve stolen food for survival as well (of course I wouldn’t have been there given that the fact New Orleans would get washed away by a storm one day has been common knowledge for decades). Store owners shot numerous looters – some of them bragged about it on TV. There were wide reports of snipers on top of some stores. There were reports about alleged racially motivated killings. To top it all off, people who thought they were going to a safe haven at the Superdome were raped, beaten, and killed by other civilians. Finally, in regards tot he anti-spam question. I respectfully submit that water is neither wet nor dry, although it can cause other items to be wet. Good article. Another rifle that is very cost effective and people are just now starting to take notice of is the Mosin Nagant. You can pick up a good example for less than $110 with cleaning kit and bandolier. Holds 6 rounds of 7.62x54r ammo. Rock solid reliable and has pretty good range and punch. The standard model is about 5′ long but has pretty good range. There is a carbine model that is more manageable for about the same price.